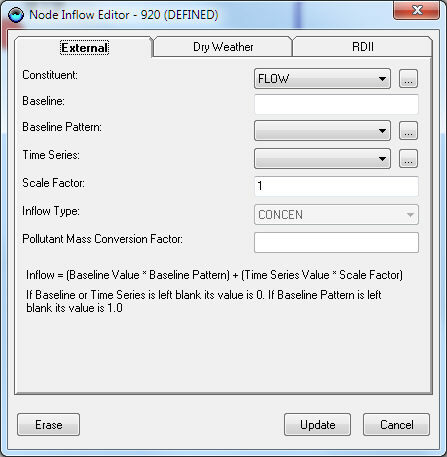 The External page on the Inflows Editor dialog is used to specify time series of direct external inflow and pollutant inflows entering a node of the drainage system. o Select node, click on the icon located at the second row of the top of the attribute browser, and then select Inflow from the initiated pop up menu. This will initiate the following External Inflow Editor. Note: Once external inflow properties are specified, the user needs to click on the button to save the properties or on the or buttons to cancel the changes and close the editor. · Select one of the group editing features (i.e., Group Editing on Selection ( ) or Group Editing on Domain ( )). · On the initiated Group Editing dialog, click on button. These steps would activate the External Inflow Editor shown below. · Once external inflow properties are specified, the user needs to click on the button to save the properties or on the or the buttons to cancel the changes. Select the button to close the editor. · The button deletes external inflow data for the selected elements only. The button empties external inflow data for all nodes, not just the selected nodes, in the drainage system. Constituent Selects the constituent (FLOW or one of the project’s specified pollutants) whose direct inflow will be described. Baseline Specifies the value of the constant baseline component of the constituents’ inflow. For FLOW, the units are the projects’ flow units. For Pollutants, the units are the pollutants’ concentration units if inflow is a concentration, or can be any mass flow units if the inflow is a mass inflow (see Conversion Factor below). If left blank, no baseline inflow is assumed. Baseline Pattern The optional Baseline Time Pattern can be used to apply a periodic adjustment to the baseline inflow value by month of the year or day of the week. Time Series Specifies the name of the time series that contains inflow data for the selected constituent. If left blank then no direct inflow will occur for the selected constituent at the node in question. You can click the button to bring up the Time Series Editor dialog for the selected time series. Scale Factor A multiplier used to adjust the values of the constituents’ inflow time series. The baseline value is not adjusted by this factor. The scale factor can have several uses, such as changing the magnitude of the inflow hydrograph while keeping its’ shape the same, without having to re-edit the entries in the inflow time series. This factor can also allow a group of nodes sharing the same time series to have their inflows behave in a time synchronized fashion while letting their individual magnitudes be different. If left blank, the scale factor defaults to 1.0. 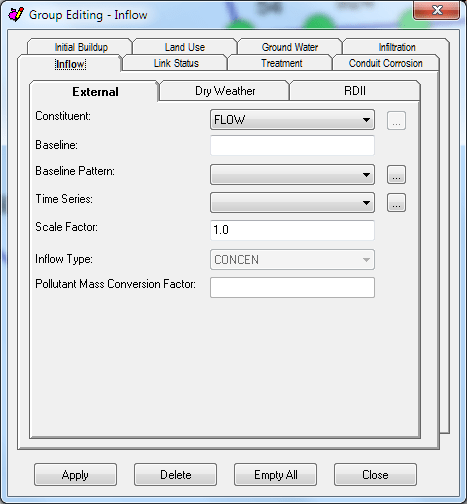 Inflow Type For pollutants, selects the type of inflow data contained in the time series as being either concentrations or mass flows. This input is not required if the constituent is Flow. Pollutant Mass Conversion Factor Numerical conversion factor used to convert a pollutant mass flow rate in the time series data into (concentration x flow) units used by the project. For example, if the time series data were in pounds per day and the pollutant concentration defined in the project was mg/L while the flow units for the project were CFS, then the conversion factor value would be 454,000 mg/lb / 86400 sec/day = 5.25. More than one constituent can be edited while the dialog is active by simply selecting another choice for the Constituent property. If a pollutant is assigned a direct inflow in terms of concentration, then one must also assign a direct inflow to flow, otherwise no pollutant inflow will occur. If pollutant inflow is defined in terms of mass, then a flow inflow time series is not required.